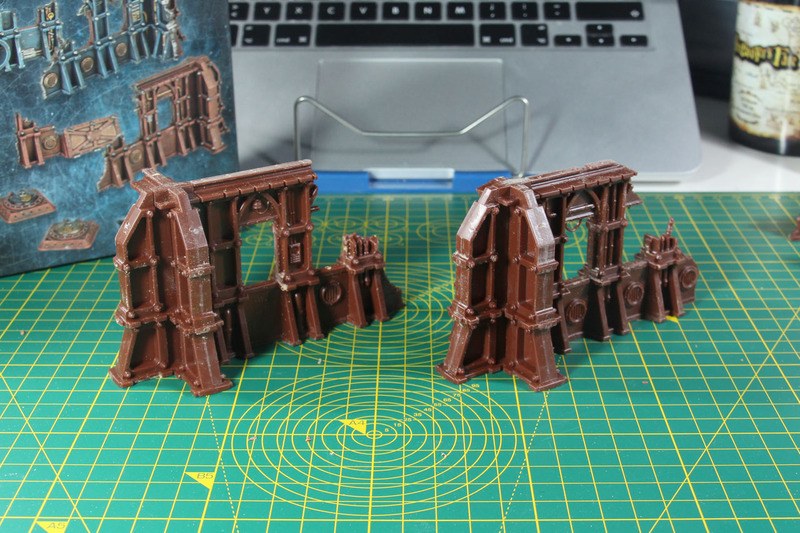 Along with the Necromunda Release, Games Workshop put a lot of suiting terrain on the market. 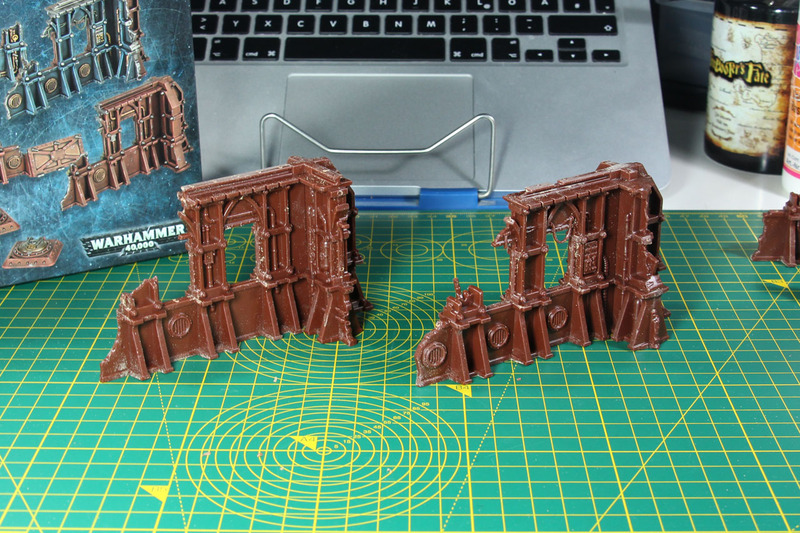 As a "entry" product, with a low price barrier the STC Ryza Pattern Ruins caught my eye and were added to my terrain collection, for their generic yet very 40k like style. 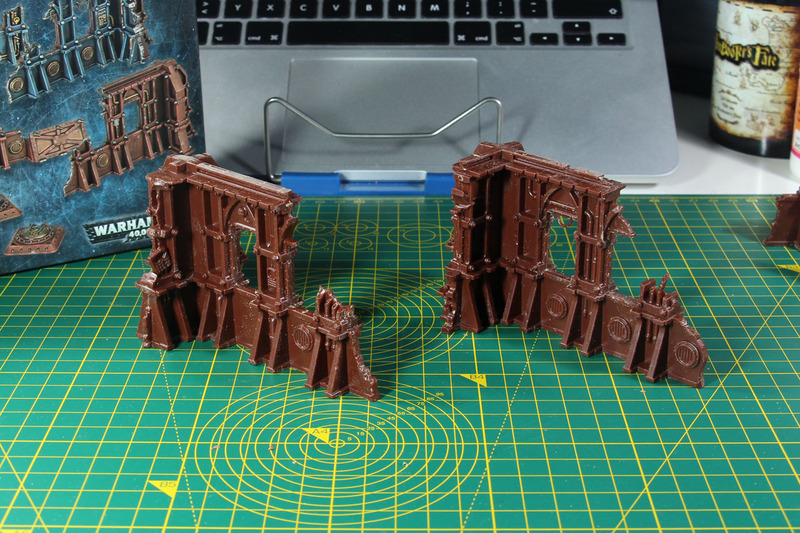 This kit gives you four larger ruin terrain pieces, four medium sized ruins / barriers and two hatches. 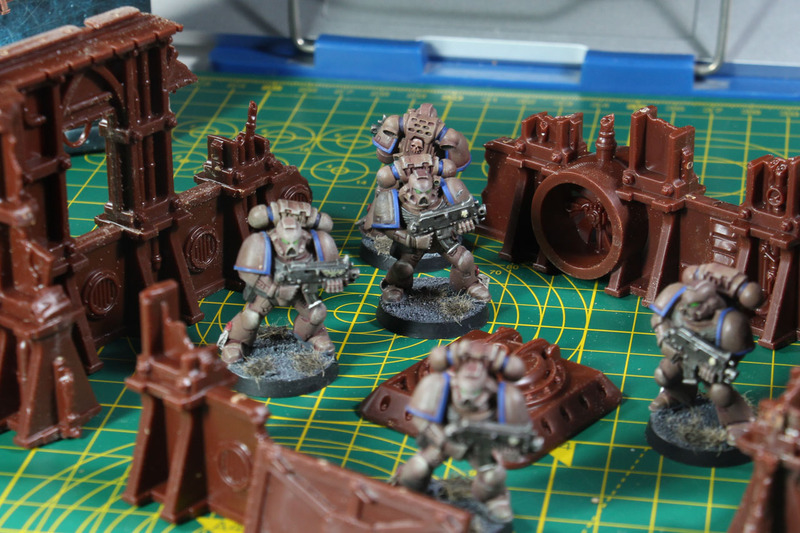 If these look familiar to you, that is not a big surprise, as this kit is the smaller brother of the Realm of Battle Moon Base Klaisus. I could not convince myself to go for the 65 EUR moon base, for a couple of reasons. You only get three sprues of terrain, compared to the four in the STC Ryza-Pattern ruins, and the card board gaming tiles come in the odd size of 66" by 40" / 1,67 m x 1,02 m which is not really useful for the usual 4' by 4-6' or 1,20 x 1,20-1,80m set ups. 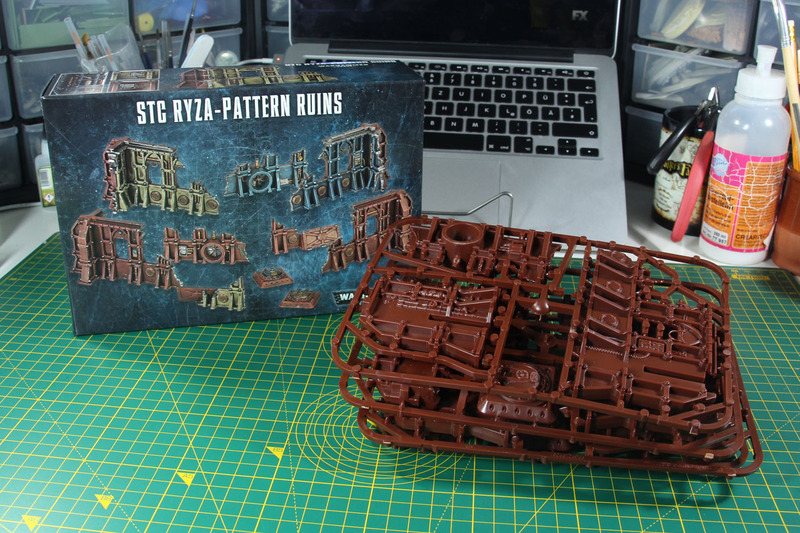 But it comes with a third sprue, that covers another set of ruins along with a pretty cool imperial ammo crate, and I was lead to believe, that this crate was part of the Ryza Pattern ruins when I ordered them. Was a bit disappointed when I found out, that this part (or better said the whole sprue) is only available via the Moon Base Klaisus set. 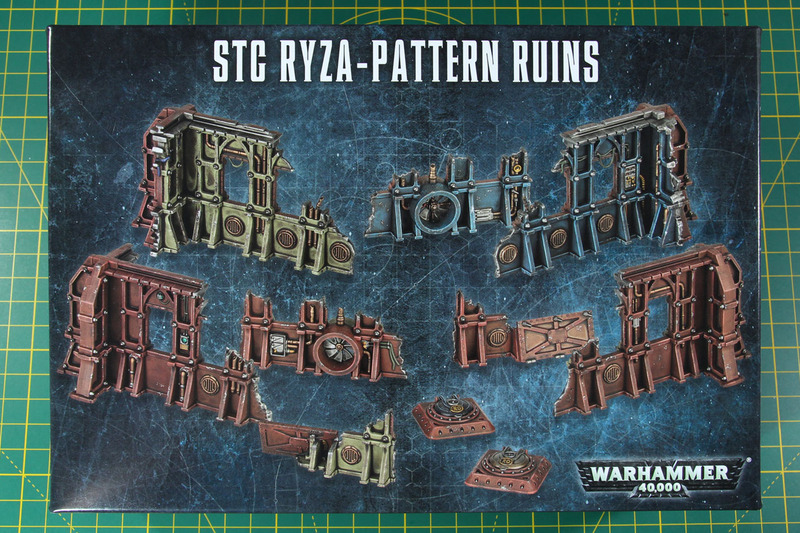 However, today it is not about the large set, it is about the smaller Ryza Pattern Ruins, that are priced at 22,50 EUR and come with a total of four sprues, of which two are the same. 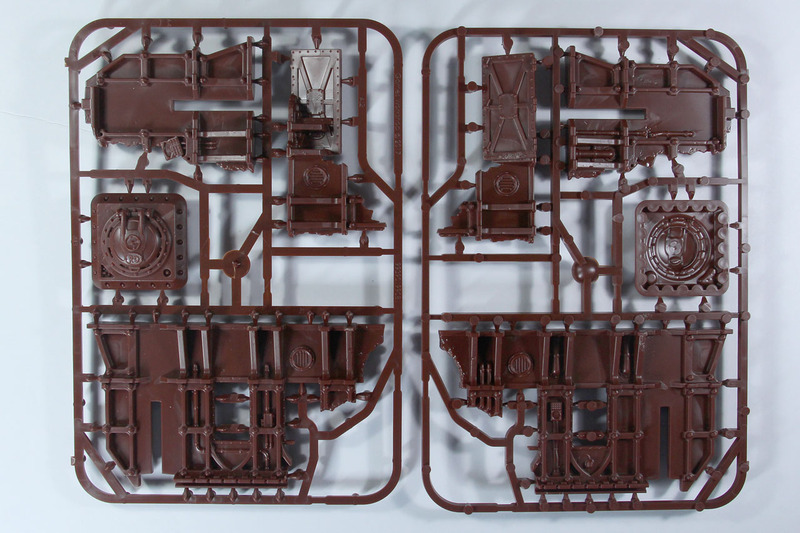 It is hard plastic, but tinted red and seems to be from the terrain producing "outpost" in China (the same factury / manufacturing line as some of the the sculpted bases) as the design and cast are not as crisp like the regular grey hard plastic sprues, that contain the miniatures or vehicle kits. 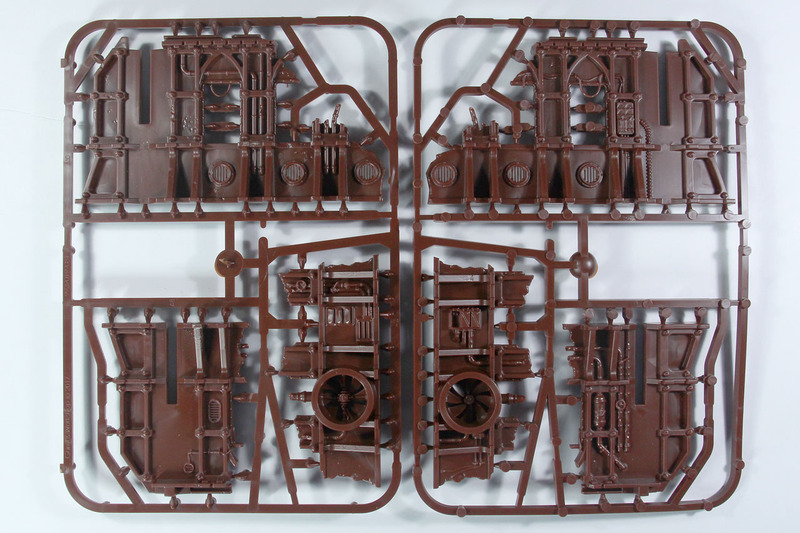 Below you can see all the four sprues contained in this set from both sides, along with an overview of the set that you receive two times. And another disappointment, Games Workshop shows more on the box than it actually contains. 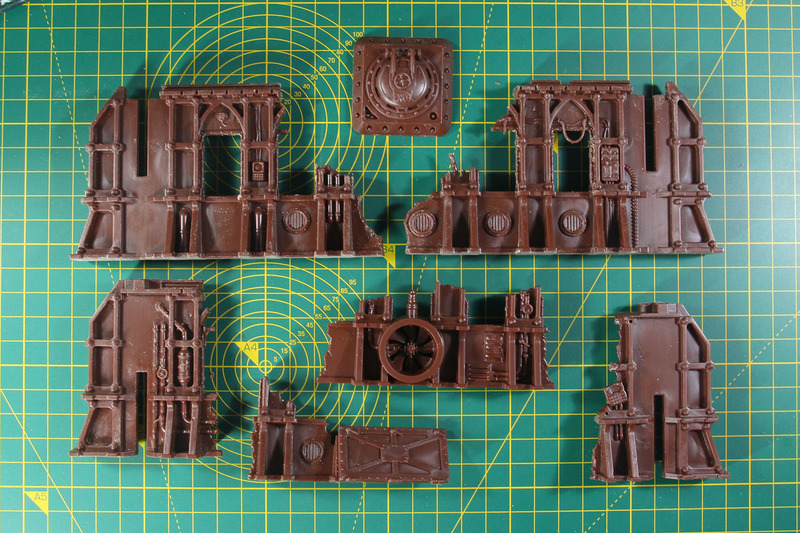 On the back of the box are three barricades / smaller ruin pieces shown, but only two are part of the sprue. 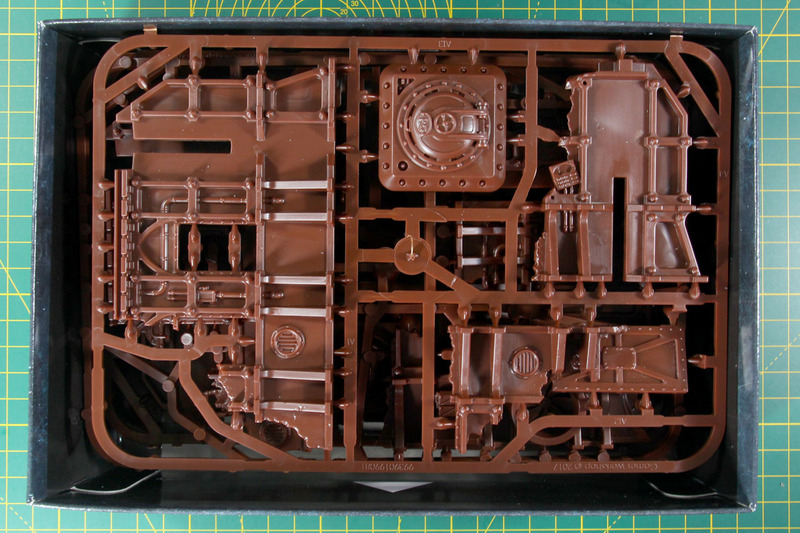 That shown piece is from the third sprue, that is only part of the Moon Base Klaisus and not part of this kit! There are no assembly instructions with this kit, but to be honest, there is no need for them. You get two longer pieces and two shorter pieces to form an t-shape. You can use either of the short pieces with any of the long pieces and turn them by 180° so you get a bit of variation as shown below. 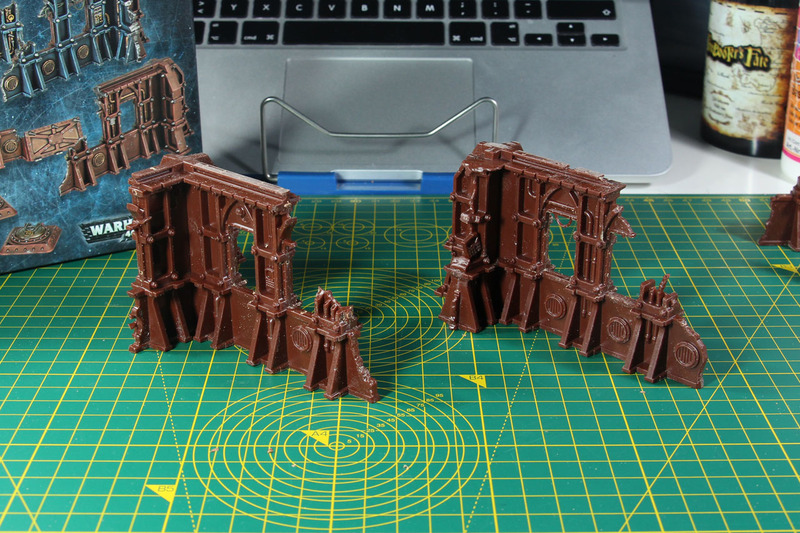 Basicly you can set up the ruin shown below two times and with the alteration (and a different paint job), the outcome will look different enough to work quite well. 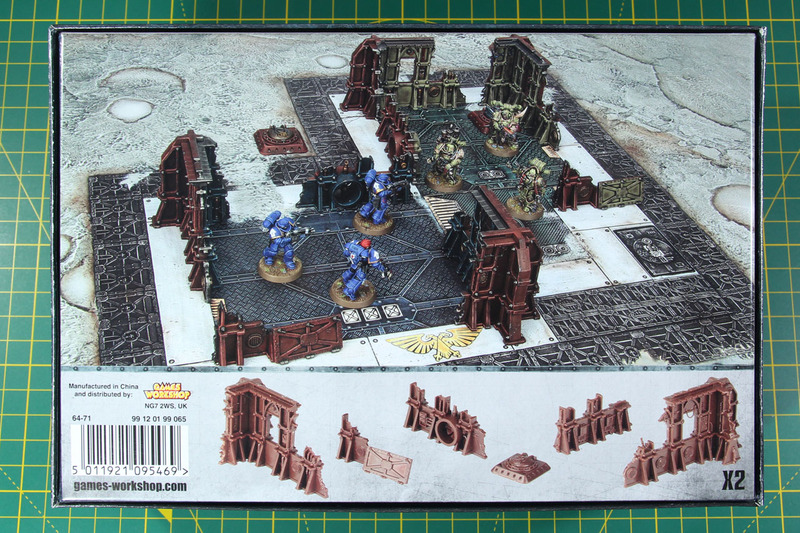 So for smaller games or skirmishes, this is a proper base to start from for the 22,50 EUR. Scalewise these pieces are large enough to count as hard cover for most miniatures and the area the ruins contain is large enough for a smaller squad of 5 miniatures. 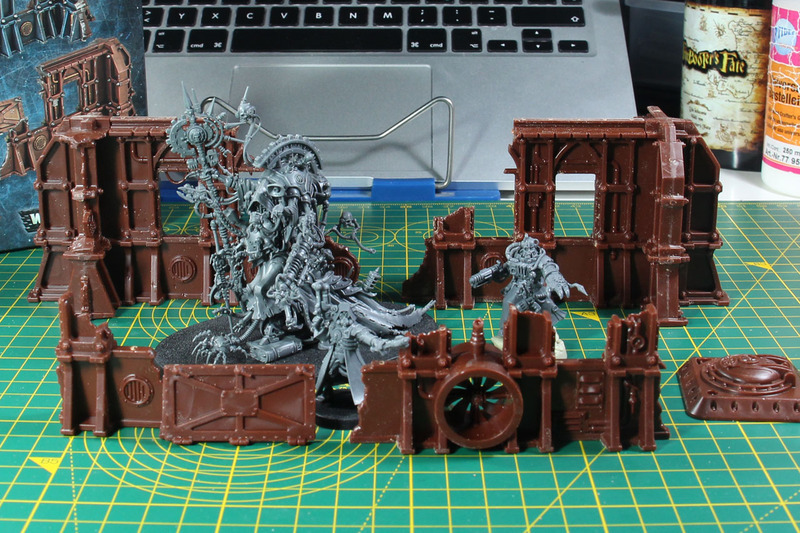 At ~5 Euro per sprue this kit is quite a deal, and you get two sets of ruins for 22,50 EUR. The design is properly done and suits the purpose. 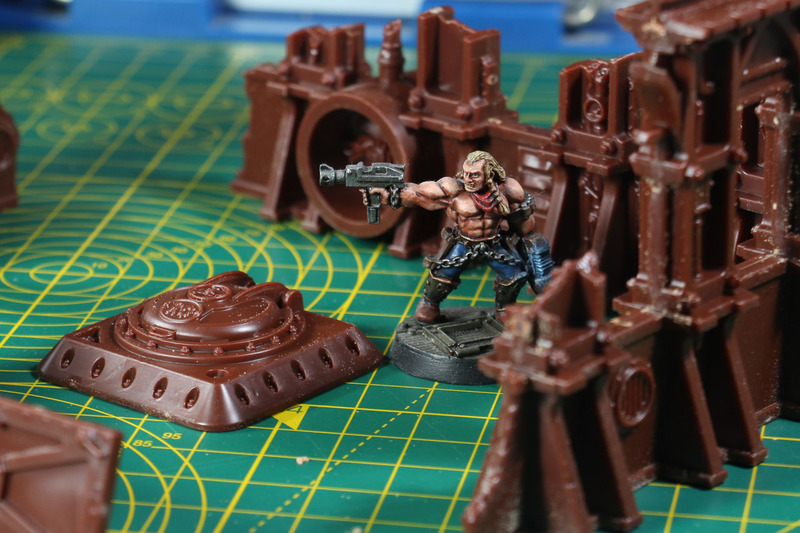 It matches the design of the Shadow War Armageddon range. As these are larger pieces and will most likely not be looked upon that closely, the more blurry cast and less crisp details of the production facility in China will not have a big impact. In my opinion this kit has the better value compared to the Moon Base, as you only get half of this box, a third sprue and a gaming board made from cardboard tiles in an odd size for triple the price. It would be great to have another option to be able to acquire the third sprue, aside of the Moon Base kit. If you already bought the Moon Base Klaisus, this is an interesting addition. 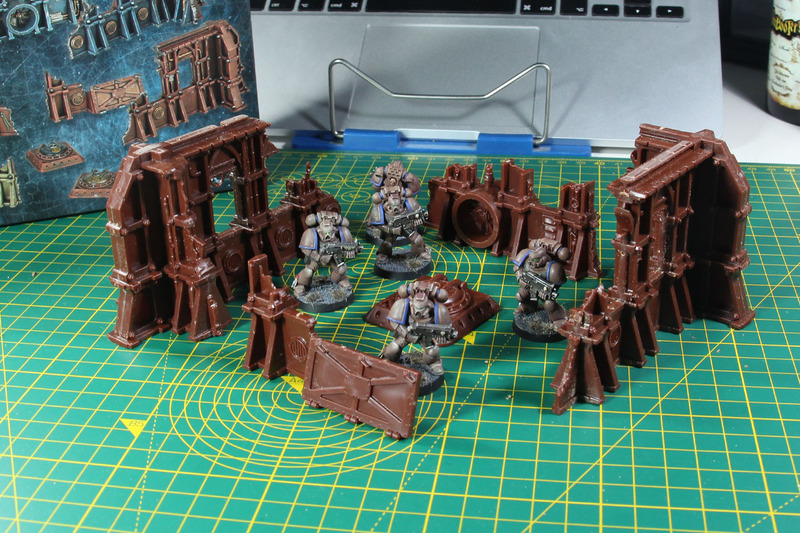 As well as to the already mentioned above Shadow War Armageddon terrain range. 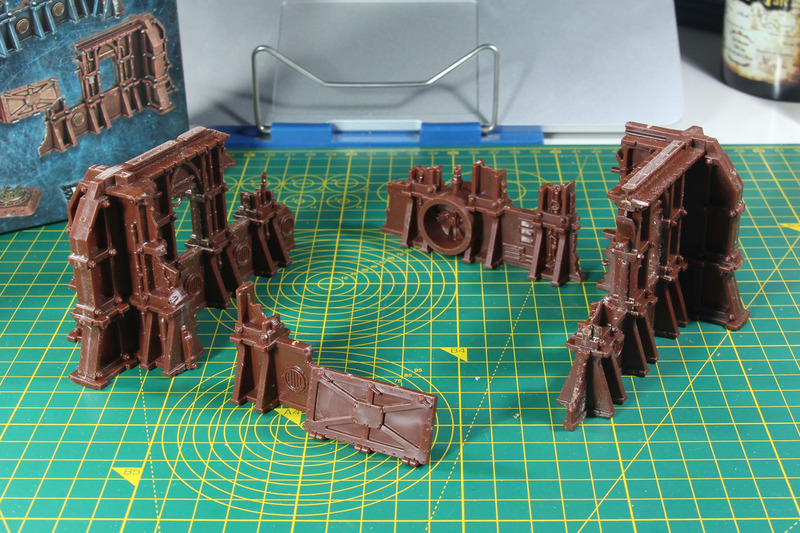 As the design is rather generic, this would mix well with Mantics Deadzone Terrain range. 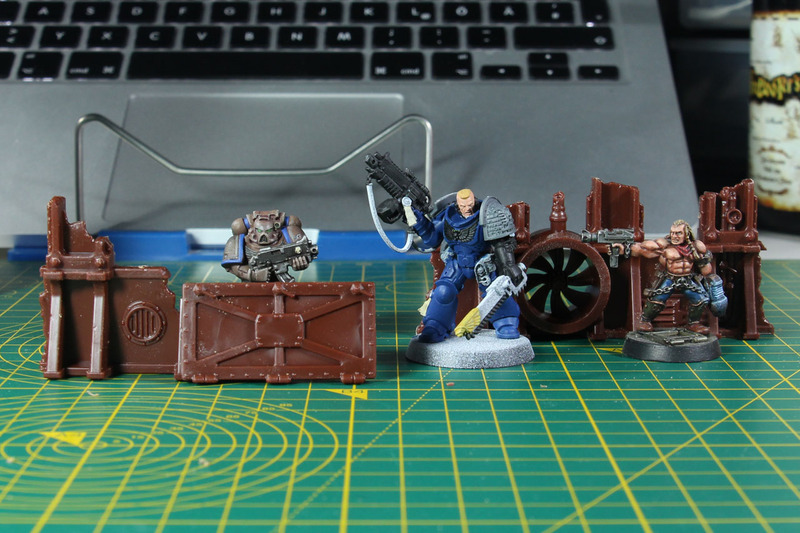 Personal Comment: I got in touch with Games Workshop about the mistake on the box contents. They had a different opinion on this topic. They apologised for stating it would be included twice, it would only be a single one of them in there. Fact, there is none of them in there. Did not receive further comment on my reply.